[S118] Census - 30 Mar 1851, UK census, ED 9 HO107-55-1 Folio 14 p22 GSU Roll 241217. Sarah Elizabeth BUCKINGHAM was born circa 1822 in High Wycombe, Buckinghamshire. [S340] Census - 7 Apr 1861, UK census, ED 3 RG9-856 Folio 60 p12 GSU Roll 542711. [S189] International Genealogical Index (IGI), Batch no: C062616 for 1859-1873; Source Call No. 0919743; Film 883908. [S190] Index - GRO and Office of National Statistics, England & Wales Civil Registration Qtrly Indexes, Marriage: District of Lewisham, Kent, Vol 5, p363, 3Q1847. [S541] National Archives of Britain, at http://www.nationalarchives.gov.uk, Royal Navy Allotment Declarations 1795-1852, ADM 27/103 entry for 1848 on Ganges. [S118] Census - 30 Mar 1851, UK census, ED 1n HO107-1657 Folio 285 p28 GSU roll 193562. [S190] Index - GRO and Office of National Statistics, England & Wales Civil Registration Qtrly Indexes, Death: District of Portsea Is, Vol 2b, p247, 4Q1859. [S677] Index - England High Court of Justice, England & Wales National Probate Calendar, Letters of Administration, granted 22 Feb 1860 at Winchester to Sarah WICKS, widow. [S340] Census - 7 Apr 1861, UK census, ED 13 RG9-633 Folio 127 p21 GSU roll 542674. [S367] Census - 2 Apr 1871, UK census, ED 15 RG10-1128 Folio 166 p27 GSU roll 827775. [S116] Census - 3 Apr 1881, UK Census, ED 17 RG11-1142 Folio 14 p21 GSU roll 1341279. [S190] Index - GRO and Office of National Statistics, England & Wales Civil Registration Qtrly Indexes, Death: District of Wycombe, Vol 3a, p428, 1Q1893. [S190] Index - GRO and Office of National Statistics, England & Wales Civil Registration Qtrly Indexes, Birth: District of Portsea Island, Vol 7, p116, 3Q1849, mother's maiden name BUCKINGHAM. [S190] Index - GRO and Office of National Statistics, England & Wales Civil Registration Qtrly Indexes, Birth: District of Portsea Island, Vol 7, p135, 2Q1851, mother's maiden name BUCKINGHAM. [S190] Index - GRO and Office of National Statistics, England & Wales Civil Registration Qtrly Indexes, Birth: District of Portsea Is, Vol 2b, p360, 4Q1852, mother's maiden name BUCKINGHAM. [S914] GRO England & Wales, birth record, District of Portsea Is, Vol 2b, p338, 2Q1858, mother's maiden name BUCKINGHAM. [S502] Index - Victoria BDMs online, at https://online.justice.vic.gov.au/bdm/indexsearch.doj, Marriage Reg. No. 6799/1942. [S1099] Cemetery Marker - , Allambe Memorial Park, Memorial, Family Rockery, Section: Jarrah, Lot 960-2. [S392] World War 2 Australian Nominal Roll, at http://www.ww2roll.gov.au, Service #337514 (VX112283), next of kin Gladys BUCKLEY, enlisted 29 Oct 1942, discharged 1 Nov 1948, with rank of Major in SIGS Cipher. [S396] Ryerson Index to Australian Newspaper Death and Obituary Notices, at http://www.rootsweb.com/~nswsdps/dpsindex.htm, reported in Gold Coast Bulletin of 19 Sep 1990, aged 84. [S396] Ryerson Index to Australian Newspaper Death and Obituary Notices, at http://www.rootsweb.com/~nswsdps/dpsindex.htm, reported in Gold Coast Bulletin of 23 Apr 1993. [S542] Index - New Zealand BDMs online, at http://www.bdmhistoricalrecords.dia.govt.nz/, Birth Reg. No. 1904/5513. [S262] Book - Rex & Adriene Evans, Faith & Farming, p393. [S542] Index - New Zealand BDMs online, at http://www.bdmhistoricalrecords.dia.govt.nz/, Birth Reg. No. 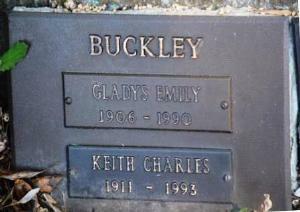 1904/5513 to Lillian Grace and Clement Henry BURDETT. [S443] CD - NZ Marriages, CD - NZ Marriages 1836-1956 V2, NZ Registrar General's Folio 7539. [S542] Index - New Zealand BDMs online, at http://www.bdmhistoricalrecords.dia.govt.nz/, Death Reg. No. 1977/30809, aged 73. She married Arthur Daniel EVANS in Australia. [S190] Index - GRO and Office of National Statistics, England & Wales Civil Registration Qtrly Indexes, Birth: District of Brighton, Vol 2b, p333, 2Q1932. [S1138] Tobin Bros Funerals Services - Tributes, at https://tobinbrothers.com.au/, funeral for Mrs Elizabeth Evans will be held at Tobin Brothers Chapel, 604 Esplanade, Mt Martha on Saturday 6 January 2018 followed by a private cremation. [S928] BDM NSW Registry, marriage record, Reg. No. 10238/1929. [S190] Index - GRO and Office of National Statistics, England & Wales Civil Registration Qtrly Indexes, Birth: District of Camberwell, Vol 1d, p875, 2Q1889, mother's maiden name SMITH. [S800] National Archives - NZ Archives (Archway), Army record R21889938, Agency AABK, series 18805, accession W5530, box 19, record 20372 and Personnel File R20545173, Agency AABK, series 18805, accession W5562, box 54, record 128453. [S800] National Archives - NZ Archives (Archway), NZ Passenger Lists 1839-1973, digital folder no. 4439884, image 42. [S720] UK Incoming Passenger Lists, 1878-1960, at http://www.ancestry.co.uk, BT26, piece 974, item 49. [S800] National Archives - NZ Archives (Archway), NZ Passenger Lists 1839-1973, digital folder no. 4448626, image 225. [S190] Index - GRO and Office of National Statistics, England & Wales Civil Registration Qtrly Indexes, Death: District of Reading, Vol 2c, p464, 4Q1935, aged 47. [S1088] National Archives - National Archive of Australia, NAA Series A6770, barcode 4422904 RAN service record for R40651. [S581] London Metropolitan Archives, at http://www.ancestry.co.uk, Saint Jude, Southwark, Register of marriages, P92/JUD, Item 005. [S190] Index - GRO and Office of National Statistics, England & Wales Civil Registration Qtrly Indexes, Birth: District of St Austell, Vol 5c, p166, 1Q1858, mother's maiden name MICHELL. [S488] Index - Queensland BDMs (online and fiche), at https://www.qld.gov.au/law/…, Death Reg. No. 1897/4472, p24107. [S488] Index - Queensland BDMs (online and fiche), at https://www.qld.gov.au/law/…, Birth Reg. No. 1890/C2119. Ann BURNETT was born in 1752. She was widowed on the death of her husband James in 1829. [S262] Book - Rex & Adriene Evans, Faith & Farming, p367. [S542] Index - New Zealand BDMs online, at http://www.bdmhistoricalrecords.dia.govt.nz/, Birth Reg. No. 1907/1766, and Death Reg. No. 1987/33932 gives this birthdate; daughter of Robert and Louise Geraldine. [S443] CD - NZ Marriages, CD - NZ Marriages 1836-1956 V2, NZ Registrar General's Folio 9232. [S542] Index - New Zealand BDMs online, at http://www.bdmhistoricalrecords.dia.govt.nz/, Marriage Reg. No. 1927/9006. [S542] Index - New Zealand BDMs online, at http://www.bdmhistoricalrecords.dia.govt.nz/, Death Reg. No. 1987/33932. 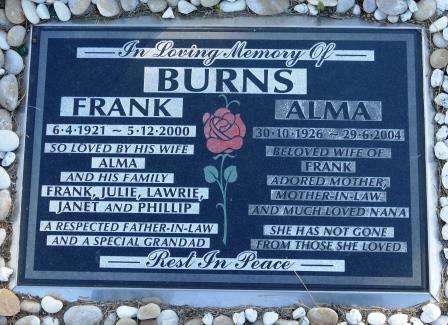 [S1144] Cemetery Marker - , Ruru Lawn Cemetery, Christchurch, NZ, Ruru Lawn cemetery, block 45, plot 430, aged 79. 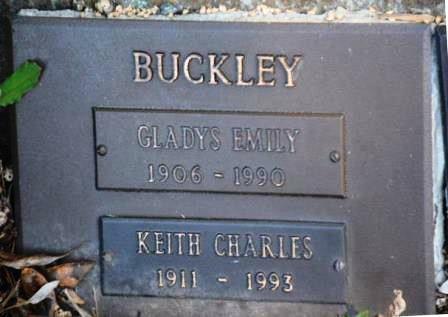 [S419] Christchurch City Council Cemeteries database, at http://librarydata.christchurch.org.nz/Cemeteries/, Ruru Lawn cemetery, block 45, plot 430, aged 79.